What was that? You like it? You like it a lot? You wish you had a copy? Then download the single for free (until 23.59 Reigate time on 16 October, when it will be withdrawn). Oh, you like it so much that you want a whole album of this kind of thing? Then go and order the new one. Singing Down The Government, or, The War of Position And How We’re Winning It is out on October 20th, to coincide with the TUC A Future That Works march, but we might have a few copies lying around for early dispatch if you pre-order. Here’s the music you get on it. But there’s twelve tracks of polemic too: a twelve point programme to destroy capitalism, if you will. Sorry – we misunderstood. You mean you want all our albums? OK. They’re all available at Soviet Beret Records. Go and buy them. 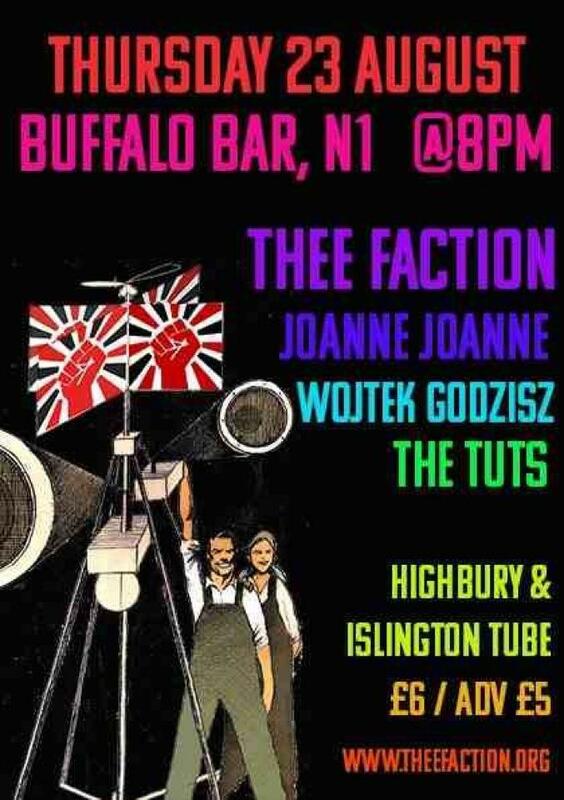 Oh, you really mean you want to experience the Thee Faction Socialist RnB experience live and unmediated? Of course you do. Then put this date in your diary: 18th October 2012. It’s the launch of the new album, a last chance to let your hair down before the march on the Saturday, and it will feature Attila the Stockbroker and Wojtek Godzisz. Do not miss this show. Do us a favour, comrade. Our marketing team is you. That is to say, no one else is going to sell our records or push our shows or get people to download our singles except you. Share everything. Put it on facebook, on twitter, on your blog, in your email. Share share share. This war of position ain’t going to win itself, you know. It’ll take teamwork and solidarity. Get working. Thee Faction, as always, salute you. And will continue to do so. Get your tickets in advance for a fiver. That’s £1.25 per band. Phenomenal value. See you there. 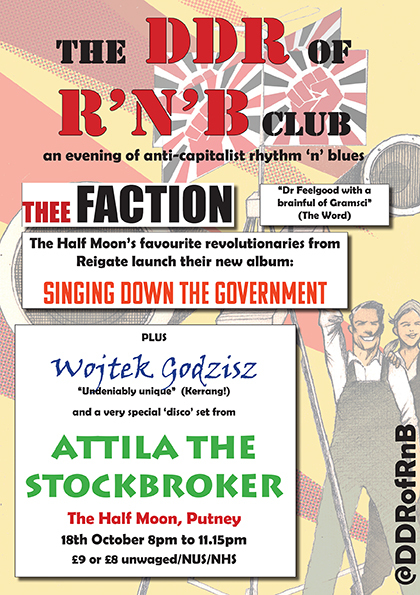 That’s Socialist RnB legends Thee Faction. All-woman Duran Duran tribute band Joanne Joanne. Wojtek off of out of Symposium. And all-grrrl punk rock phenomenon The Tuts. All chums of ours. It’s going to be super-comradely and fun, as you’d expect of a Guided Missile night. Check the on-stage times to make sure you see all four bands.